I began inline speed skating at the age of 8 in Crestview, FL. I competed till I was 13 years old, winning numerous National Championships in my category even a couple National records. In 2002, after the Winter Olympics, my dad and I drove out to Salt Lake City to participate in an ice speed skating camp. After an amazing week on the ice I became hooked and decided on my future right then and there. On the drive back to Florida I called my mom and told her how much I loved it and that I wanted to move. I was half joking at the time but apparently my mom didn’t think so. After a day and a half of driving back to Florida my dad and I walked into the house to find a dozen brown boxes and half the house packed up. Three weeks later we were off to Salt Lake City chasing my Olympic dreams. From 2003 to 2010 my life was speed skating. Four Jr. World Teams, three time Jr. National Champion, multiple Sr. World Cup Teams, and two Olympic trials. After the 2010 Olympic trials I had reached my limit, both physically and mentally. I stepped away from the sport in search of a new passion, love, or perhaps a dream. I was having some difficulty accomplishing this new endeavor but that's right about the time competitive cycling came into my life. I had always ridden a bike to cross train for skating but I never envisioned myself racing one. After competing in a local criterium and placing 2nd, I knew this was something I had to try. Within a year of racing I was joining a national level team and racing against the best women in the country. In 2013, and for the next three years, I raced for the Visit Dallas/DNA Cycling team. Racing as an international competitor, I was able to accomplish a lot in my cycling career with numerous podium finishes and earning multiple Green Sprinter Points Jersey’s; a prestigious award for a sprinter within a cycling stage race. In the winter of 2015 while training for cycling on the indoor trainer I got the idea to visit Salt Lake City with my boyfriend at the time, Ryan. I wanted to show him around the city and maybe touch the ice again after 6 long years. I never imagined what would happen next. When I stepped on the ice it all came rushing back to me. Not only the skill of skating but the love for the sport. After a weekend of pure enjoyment we returned home. For the next 2-3 weeks I continued to train for the upcoming cycling season, but couldn’t get skating out of my mind. I would talk with Ryan about all the details of making the team, and braking down lap times. Eventually he advised me to give it another try. A month after we had visited, I was back. The goal was to try and skate a specific time to qualify for the US National Championships in Milwaukee, WI. The plan was to skate for a week and try to get my skating legs under me before racing that weekend’s time trial. Surprisingly I was able to skate a good enough time and only be 4 seconds off my personal best. I didn’t say anything but this solidified my comeback. I returned home, and two months later my car was packed and I was moving to Salt Lake City. The New Year was welcomed with a new adventure. After a week of moving and unpacking I was off to US Nationals to skate the 3,000m and Mass Start. Arriving in Milwaukee and walking into that oval, not knowing my place in this sport anymore was one of the most nerve wracking feelings. I was the last pair of the 3,000m, so stepping to the line I knew the times I had to beat and I knew it would be close. The gun shot and my heart dropped. I can’t explain the feelings that were rushing through me during the race. From complete insecurity to absolute bliss, this race changed my life. I crossed the line with a new personal best time by 4 seconds, and as the new National Champion. Two days later I competed in my first Mass Start race, a relatively new event in ice speed skating where up to 25 girls race at the same time for 16 laps. Trying to take some of my cycling strategy to the ice I was able to capture my 2nd US National Championship title. After my results at this event I was asked to join the US National Team training in SLC. Fast forward to present day, where I live each moment devoted to making the 2018 Winter Olympics. I will have many challenges and competitions before then but I’m determined to make each moment count to bring me closer to my lifelong dream of becoming an Olympian. 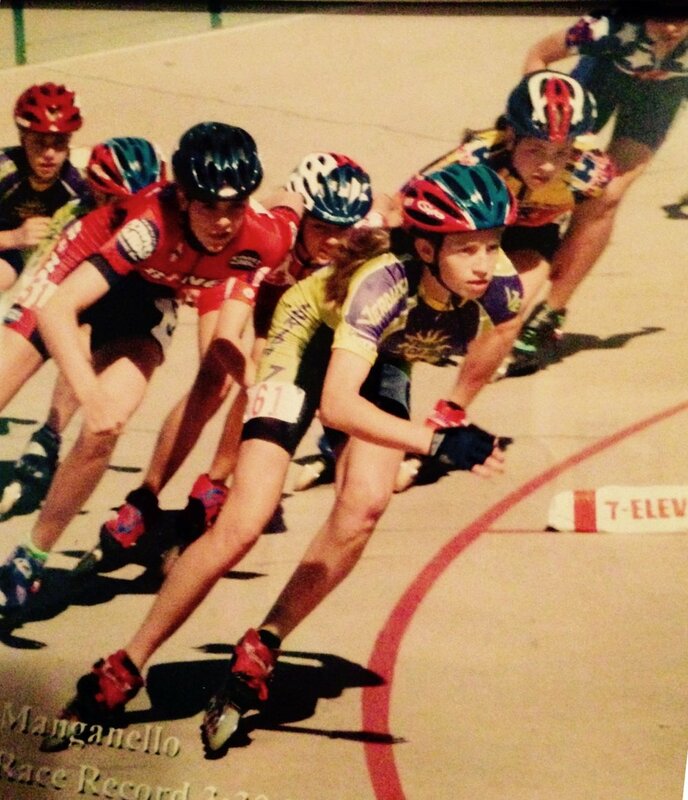 2002 was my last year as an inline speed skater and I went out with a bang! Hard weeks of training call for a special treat and when it's not pizza it's DONUTS!!! !